Mughlai cuisine is a South Asian cuisine, influenced by the imperial kitchens of the Mughal Empire. The cuisine is strongly influenced by Persian as well as Turkic cuisines of Central Asia. Mughals did everything in style and splendor. It represents the cooking style used in Delhi and Punjab. 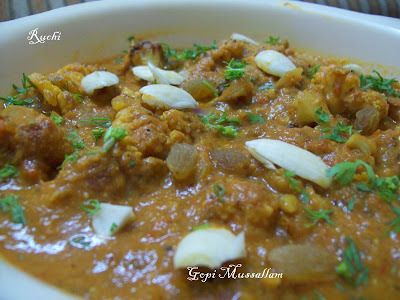 Mughlai cuisine vary from extremely mild to spicy, and is often associated with a famous for the exotic use of spices, dried fruit and nuts and milk combine to create rich, in fat, carbohydrates and proteins..One of such recipe is Gobi Musallam. Musallam meaning “whole” .Whole Cauliflower (Gobi) marinated and cooked with a spicy gravy in a typical Mughlai style and a rich creamy dish that is said to a jewel of the Awadh Cuisine. 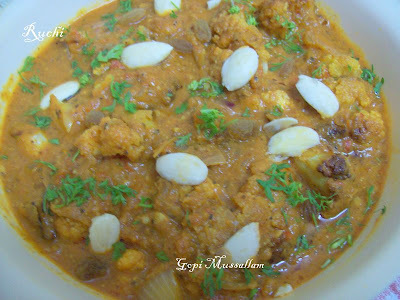 Gobi Musallam is a delight for the saviours of Indian vegetarian recipes. 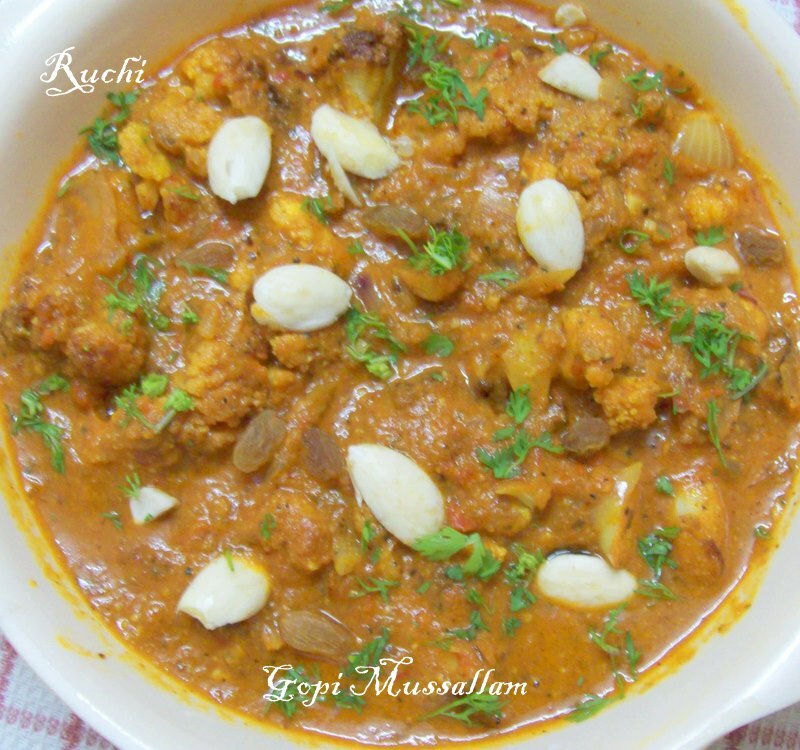 The Gobi mussallam are easy to prepare and quite eye appealing; delicious and healthy side dish with rice or chapati/puri, you can have them with a gobhi musallam for a meal.So let’s get started with how to make Gobi Musallam. Almonds& Raisins few for Garnishing. Method of cooking "Gobi Musallam"
1.In a pan roast together cumin seeds, coriander seeds, cinnamon, cardamoms and cashewnuts till they are aromatic. 2.Fry the sliced onions on medium level till brown.Allow to cool. 3.Grind together browned onions, roasted spices, green chillies and chopped ginger-garlic with a little water. 4.In a pan bring to boil the water along with some salt.Place the cleaned cauliflowers in hot water for about 10 minutes.Remove from water, wash well and wipe dry. 5.Heat half the oil in a heavy-bottomed pan till hot.Add the cauliflowers. 6.Cover and cook while stirring occasionally on medium level till the cauliflowers are browned lightly and cooked.Remove fried cauliflowers from the pan and keep aside. 7.Add the remaining oil, heat it till hot and fry the paste on medium level till the oil separates. 8.Add the turmeric powder, hot spice mix, red chili powder and fry for a few seconds. 9.Add the tomato puree, water and sprinkle salt to taste and Mix well. 10.Reduce the flame and add the milk slowly whilst stirring to get a thick gravy. 11.Stuff a little of this gravy in between the cauliflower florets and stems. 12.Add some water to the remaining gravy to get a desired consistency.Pour the gravy into a bowl. 13.Now place the stuffed cauliflowers in the same pan and pour the gravy over it evenly. 14.Cover tightly and keep on low flame for about 5 minutes or till it is heated through fully. 15.Alternatively arrange the cauliflowers topped with gravy on a serving plate and heat through in a preheated oven. 16.Add some, almonds and raisins Garnish with fresh cream and finely chopped coriander leaves. Serve hot with pulav ,Naan ,Roti or with plain Rice.. 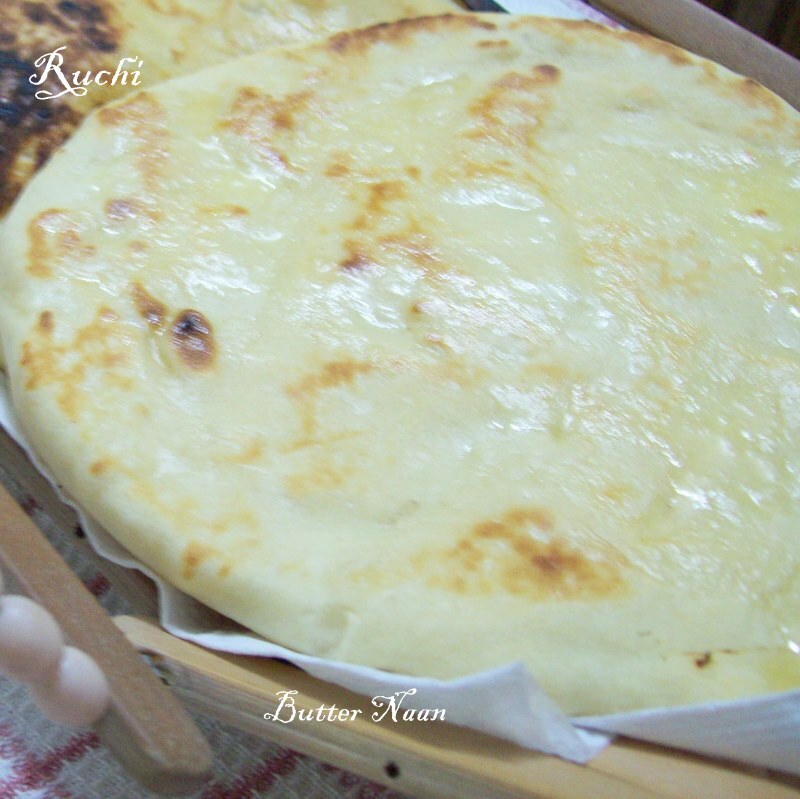 Thanks to Raks of Rak's Kitchen for this recipe Naan (without yeast). 1 Sieve flour, baking pwd, baking soda and salt two times. Place the sieved flour on a wide plate. 2.Make a well in the center of the flour and pour sugar, milk, yogurt and slowly combine, to form a soft dough. Cover with damp cloth and let it rest for 2 hrs. 3. After two hrs, knead the dough gently for 2 mts. Dust the working surface with some flour, pinch a large lemon sized dough and roll into a thick roti, slightly elongated in shape. 4. Wet your fingers with water and run your fingers along one side of the roti. 5 Heat a iron tawa and once its hot, place the naan, wet side down and place a lid and cook for 40-45 secs on high flame. Remove the lid and you will find that the naan bubbles up. 6.Now cook the other side of the naan over direct heat of the burner using tongs, spreading the naan all over the heat such that brown spots appear. Do this for a few secs only and not too close to the flame. 7. 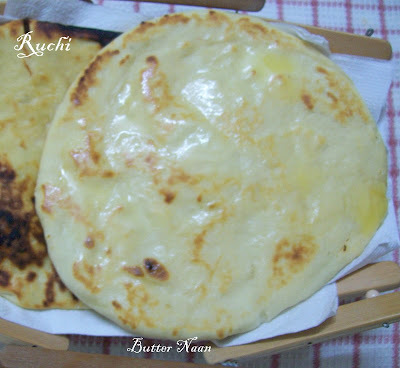 Drizzle some butter over the naan and serve hot with any curry of your choice. Gobi musallam is new to me and sounds great too,have to try it out soon! Naan and this gravy makes a wonerful combo! What a coincidence, even I posted the same preparation. isn't it great. Gravy looks great! Delicious combination with Nan. Gobi musallam and butter nan both together makes me hungry...Rich looking musallam..